Villa Anna Maria is a perfect choice if you want to be within walking distance to Gerani Beach and a choice of shops, bars and restaurants. This 4 bedroom villa has a large private pool, as well as distant sea views from the raised terrace. A terrific villa, in a central location! Just 20 minutes by car is the beautiful resort of Chania and its charming old town and harbour. Pool heating, WiFi and air conditioning/heating in all the bedrooms are included. Gerani Beach and a choice of shops, bars and restaurants are just a stone's throw away - a top choice! The outside area is great! There's a large private pool, which takes pride of place within the spacious grounds. To one side, on the grass area is the brick BBQ, as well as a table and chairs. A few steps lead to the raised covered terrace, which has views of the sea in the distance along with a further dining set - great for an alfresco meal. There's ample parking for your hire car on the driveway. From here, a few steps lead to the covered porch and front door. The open plan living area is bright and spacious, with a touch character from the high wooden beamed ceiling. There's patio doors, which lead out to the raised terrace and pool area, as well as a large window where you can enjoy the distant sea views. The lounge is comfortably furnished with 2 sofas, a flat screen TV and a feature fireplace. To one side is the dining table and chairs, along with the well-equipped kitchen. On the ground floor, there's 1 double bedroom with an en suite shower room and patio doors leading to the side terrace. You'll also find 2 twin bedrooms, one with access to a further side terrace. There's also a separate bathroom. Upstairs, on the mezzanine level, is 1 twin bedroom with en suite shower room, overlooking the open plan living area. This villa is registered and licenced by EOT Greek licensing association. This number is: 1042K91002899301. If you want a centrally located, beach villa , then this is a great choice! Gerani Beach and a selection of shops, bars and restaurants are practically on your doorstep. The lively resort centre of Chania is also just a short drive away. Here you'll find the beautiful harbour, which has several bars and restaurants, as well as the quaint old town with several shops. 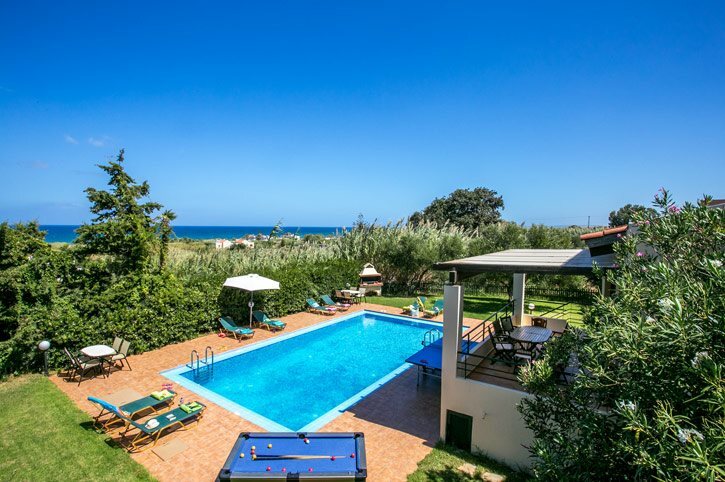 Villa Anna Maria makes a great base for exploring the east side of Crete either on foot or by car. Within walking distance to Villa Anna Maria is a bakery, mini market and a small selection of everyday shops. There's a supermarket in the nearby resort of Platanias, which is just 2 miles away from the villa. For a more diverse choice of shops, then why not visit Chania? You'll find a mix of modern shops, traditional handicrafts and small grocers. Every Saturday in Chania is an open-air market where you can buy anything from fruit and vegetables to the local cheese and yogurts. There is a choice of tavernas and bars in the area of Gerani, which are within walking distance to the villa. For a taste of the authentic Greece, then the Venetian Harbour in Chania is well worth a visit, where you'll find an array of waterfront bars, cafes and restaurants to suits all tastes. The closest beach to Villa Anna Maria is Gerani, here you'll find clear waters and a couple of tavernas selling local dishes and cool drinks. Just 2 miles away is the golden sandy beach of Platanias where you'll find sunbeds, umbrellas and snack bars. For some family fun, why not take a drive to Limnoupolis Waterpark? Here you'll find waterslides for the adventurous members of the group and lazy river for those who want a slower pace. Platanias Beach offers a choice of water sports and from May to September you may also get to see the loggerhead sea turtles nestling on the beach. There are many places to visit in Crete, from the Samaria Gorge, which is the Europe's longest gorge that's 11 miles long! You'll also find The Botanical Park, that due to its microclimate it can grow anything from mangos and lemon grass to rhubarb and papaya. The old town of Chania is a must see! Steeped in history with its architectural features which has survived both the Venetian and Turkish occupations. Lastly, the monastery on the Akrotiri is ravelled in history and its said that the monks produce some excellent wine. Villa Anna Maria is not available to book for season as it is sold out. Take a look here at the Crete villas that are currently on sale. Really lovely Villa, lots of space and great location. Well maintained and regularly cleaned during our stay. This is a beautiful villa, with a very attentive owner. The sheets and towels were spotless and soft! The cleanliness was of a high standard with a thorough maid service twice a week. Everything provided was of a good standard and the pool a lovely size. It felt homely, spacious and comfortable. We loved the outside area which was covered over making a shade from the sun, enabling us to eat outside in comfort! Keep doing what you do! The cleanest, most modern villa we have ever stayed in with Villa Plus out of 9 bookings to date. Villa was absolutely lovely, wonderful garden and sea view. Great location near to the peaceful resort of Malame which we really liked although stones on the beach so no good for sandcastles, just really pretty. Easy to drive to sandy beaches. Enjoyed being able to walk to bakery and tavernas. Rep recommendations really good for us and she responded promptly to a couple of queries whilst we were there. Overall loved Crete, would definitely return. The villa was fine. We booked it primarily as it was in western Crete. The pool was fantastic, warm and a very good size which really made the holiday. Thanks very much to Helen our Rep, who was fantastic, the info provided for getting to Samaria Gorge made it a very easy day and the roast chestnuts were fab! Good location with access to places to eat in easy walking distance. Please carry on with what you are doing, this will not be the last time we book with Villa Plus. Thank you. We were very pleased. We loved the location, quietness, not over looked, nearness of Bakery for our breakfast, the pool with inflatables couldn't keep the children out, the table tennis (we had tournaments), the dishwasher so we didn't do any washing up. The rep Sally told us of some great days out and how to get there. Best holiday we've had for a long time.